Students from the Massey College of Business struck again this past week, landing major awards at two different international competitions. The Chartered Financial Analyst (CFA) Institute Research Challenge is an annual global competition that provides university students with hands-on mentoring and intensive training in financial analysis. Students work in teams to research and analyze a publicly traded company — sometimes even meeting face-to-face with company management. Each team writes a research report on their assigned company with a buy, sell, or hold recommendation and may be asked to present and defend their analysis to a panel of industry professionals. Belmont’s CFA team team consisted of senior finance major Cody Fincher, junior finance major Nate Newcomb, accelerated MBA student Gray Finney, and Professional MBA students William Gilmore and Lauren Vandermark. After winning the Nashville/East Tennessee regional competition last month, the team moved on last week to the Americas competition in Atlanta, which included 350+ teams from the U.S., Canada, Central and South America. Belmont’s team finished third overall among all Americas teams—their presentation on Ryman Hospitality can be seen here (fifth video down from the top of the page). Meanwhile, 21 of Belmont’s 23 student representatives placed in the top 10 in their respective events at the DECA International Career Development Conference held this week in Orlando. DECA prepares emerging leaders and entrepreneurs in marketing, finance, hospitality and management in high schools and colleges around the globe. Collegiate DECA’s Competitive Events Program allows students to put their experience, skills and knowledge to the test while representing their college or university. Students compete for top international honors in one of 24 different competitions. Collegiate DECA competitive events recognize student achievement, provide opportunities for traveling to conferences and networking with peers. 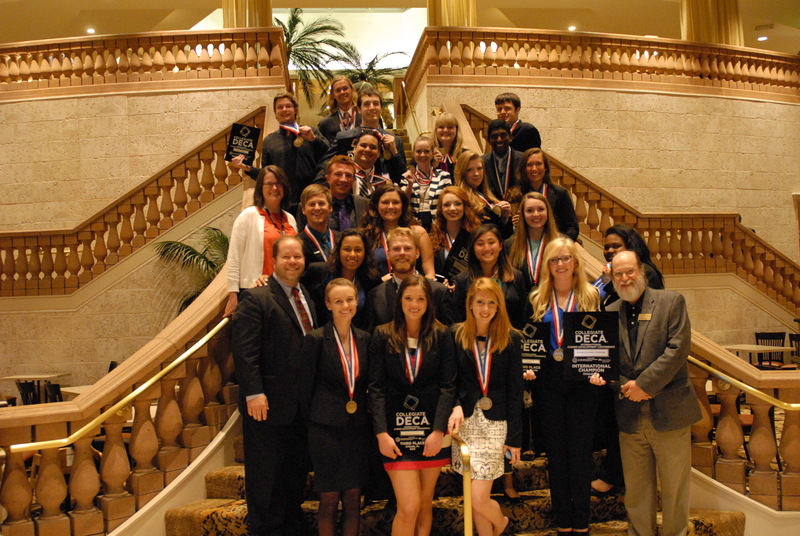 The Collegiate DECA Competitive Events Program is recognized for helping to prepare students for their professional careers–in all events students are judged by business and industry professionals. Of particular note, seven of Belmont’s eight student teams advanced to the final round of the Entrepreneurship Challenge, and all seven ultimately placed in the top 10.